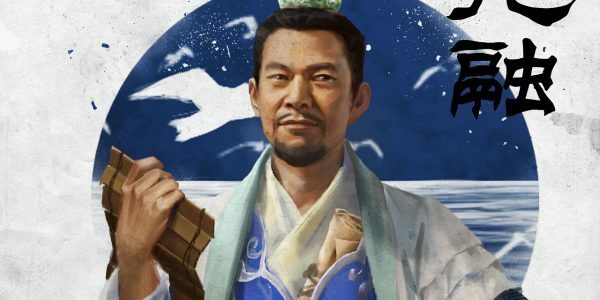 Kong Rong is unique among the starting heroes in Total War: Three Kingdoms as the only Strategist. Each character in the game is a member of one of five classes, such as Commander and Vanguard. While there are sure to be plenty of Strategist characters, Kong Rong is the only playable Strategist faction leader. 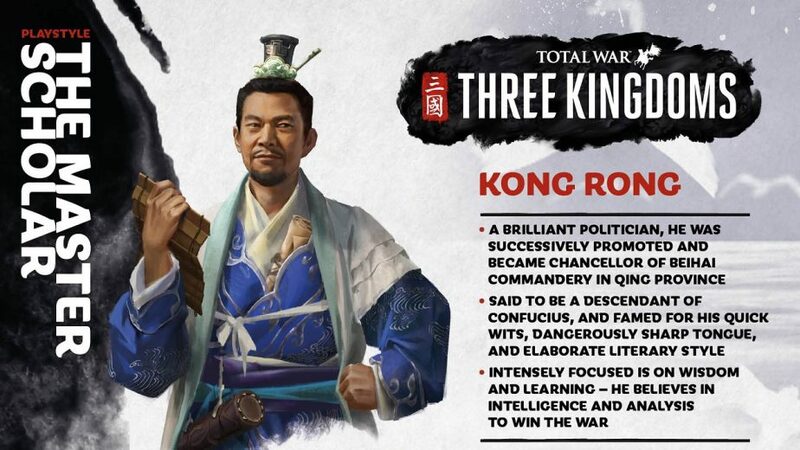 In keeping with his historical opposition to the warlike Cao Cao, Kong Rong relies on a pacifistic play-style, according to Creative Assembly; one which emphasises trading, diplomacy, and education. Knowledge, not military might, is the Master Scholar’s weapon of choice. Kong Rong may be the best faction leader for trading. 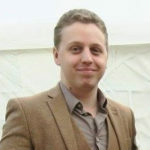 He has significant bonuses in the new Trade Influence system. For instance, he is capable of forging unique diplomatic deals which boost trade. By promoting trade influence, Kong Rong can become a powerful force without seizing much territory, relying on trade partners and allies for protection. Those allies are likely to include Liu Bei; who fought alongside Kong Rong during the Yellow Turban Rebellion. He can also rely on Wang Xiu, his loyal general. The Master Scholar begins play in Beihai Commandery, towards the south-east of the map. 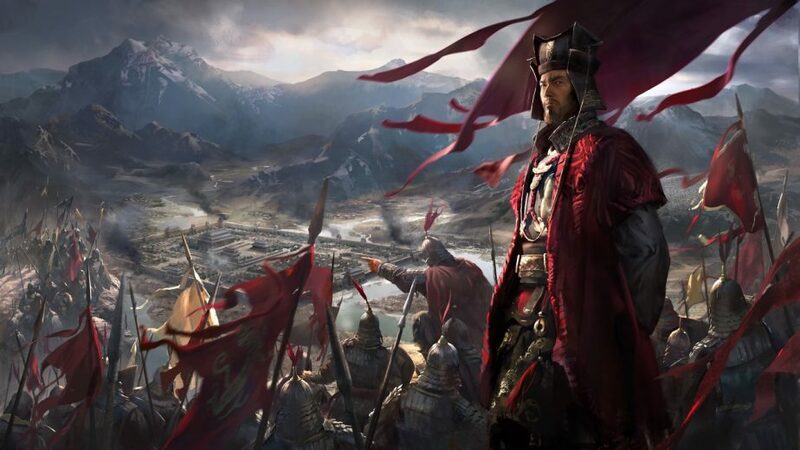 His campaign begins with him fighting against remnants of the Yellow Turbans; a conflict which gives him the chance to recruit heroic warrior Taishi Ci. When Kong Rong served the Emperor Xian and the Han government, he often spoke against Cao Cao; a habit which saw him stripped of his position due to Cao Cao’s influence over the emperor. Some years later, the two were still on poor terms. At that time, a messenger arrived from Sun Quan to address the imperial court, and Kong Rong openly criticised Cao Cao in his presence. As a result, the ruthless warlord had the scholar charged with attempting to start a rebellion and other more petty crimes. He and his family were executed on Cao Cao’s orders. So fearful were the Han officials of Cao Cao afterwards that nobody dared to give Kong Rong a proper burial. Kong Rong’s four special abilities are still under wraps. However, Creative Assembly have revealed their names, and vague descriptions of each one. It’s unknown if these could include his bonuses when trading, or whether they may be wholly separate skills for the Master Scholar.